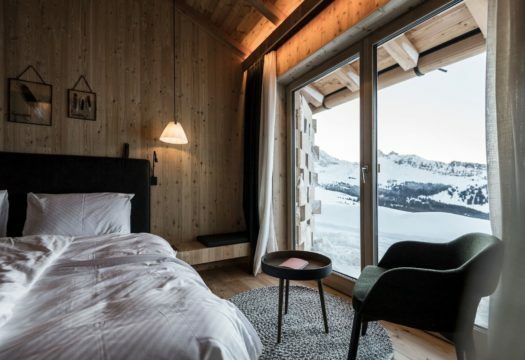 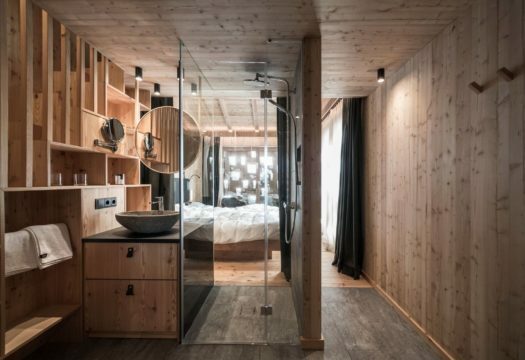 The noa* (network of architecture) architecture studio has created Zallinger, a distributed hotel in the Dolomites. 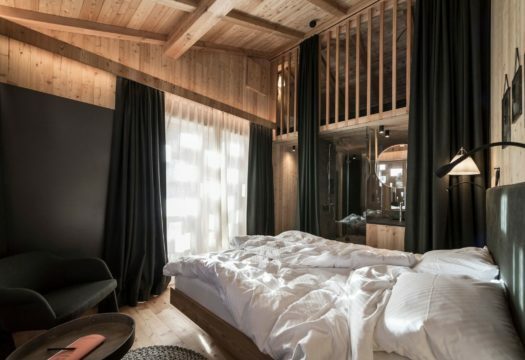 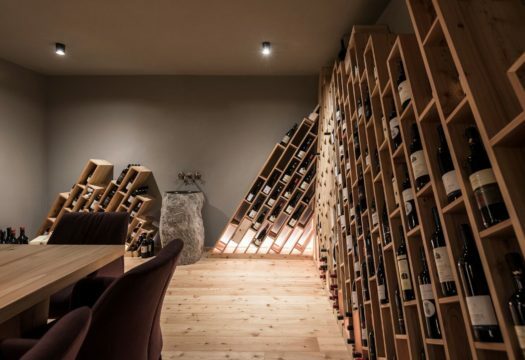 Located in the area of Alpe di Susi, the facility has the charm of a mountain village of the past, and has the quality of a new model of hospitality based on recovery of history and landscape, featuring traditional forms and materials while offering high quality, good design, comfort and sustainability. 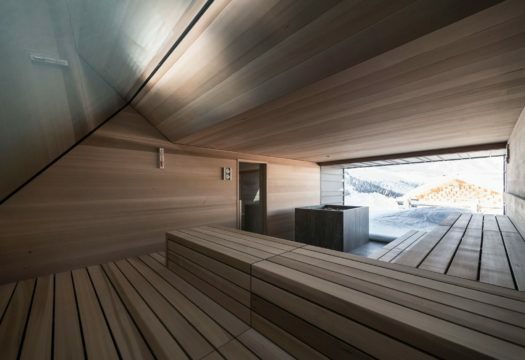 The project comes from the expansion of the Rifugio Zallinger, opened in the mid-1800s at an altitude of 2200 meters, below the Sassopiatto. 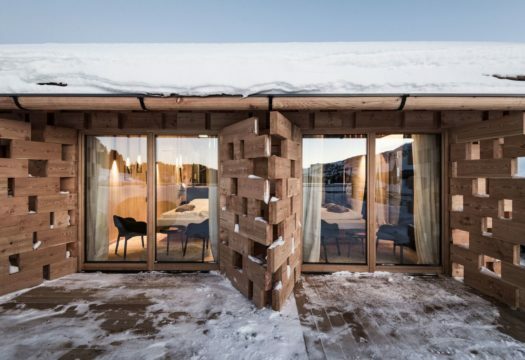 It has created new spaces without altering the existing volumes, giving the historic settlement the character of a small village, as at its origins. 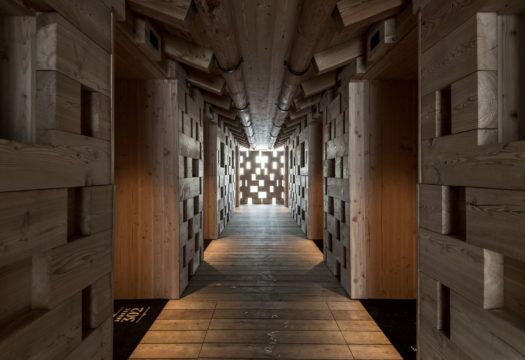 Through the solutions and materials utilized, the place recreates a sensation of the past, in full respect for the environment and local traditions. 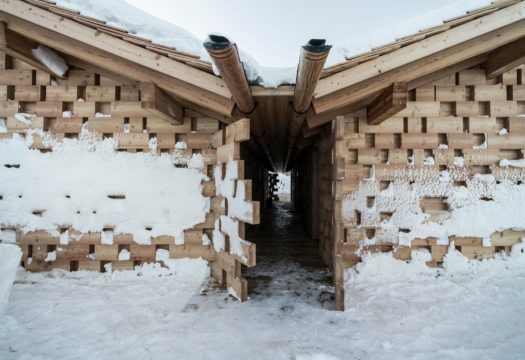 The refuge was once surrounded by seven barns and a small church. 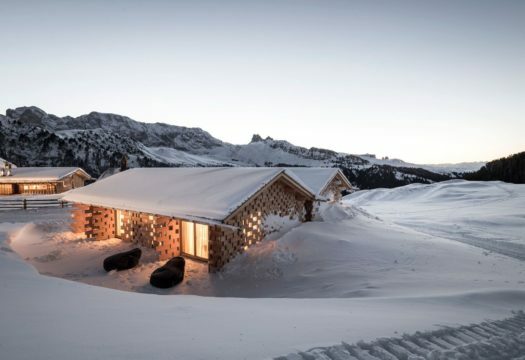 In 1880 the barns were replaced by a single large construction. 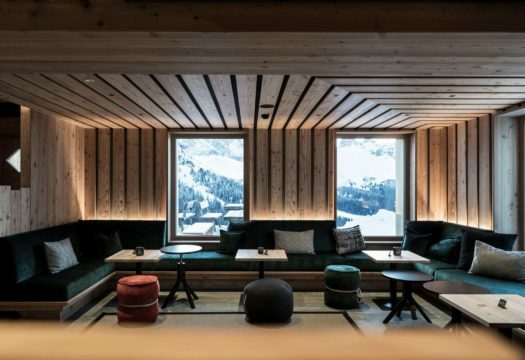 The expansion has been an opportunity to recreate the original arrangement: besides the renovation of the main volume for the hotel, seven chalets have been created, which reinterpret the traditional forms of Alto Adige in a contemporary way. 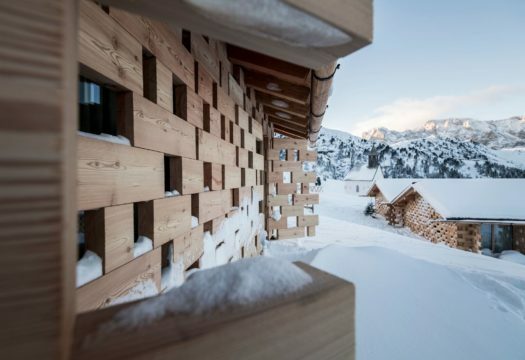 The external cladding is based on the structures of historic haylofts: blocks of solid wood, in an alternating pattern of solids and voids, wrap the chalets and generate the dominant motif of the project, also in the internal spaces. 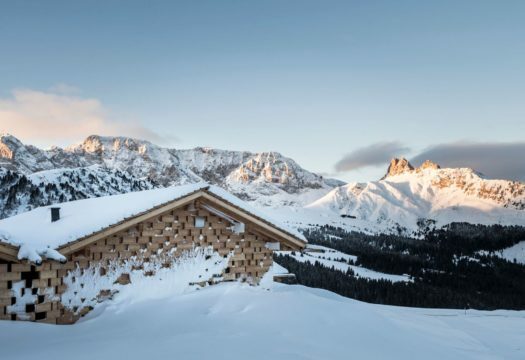 For the roofs, the typical wooden shingles have been applied. 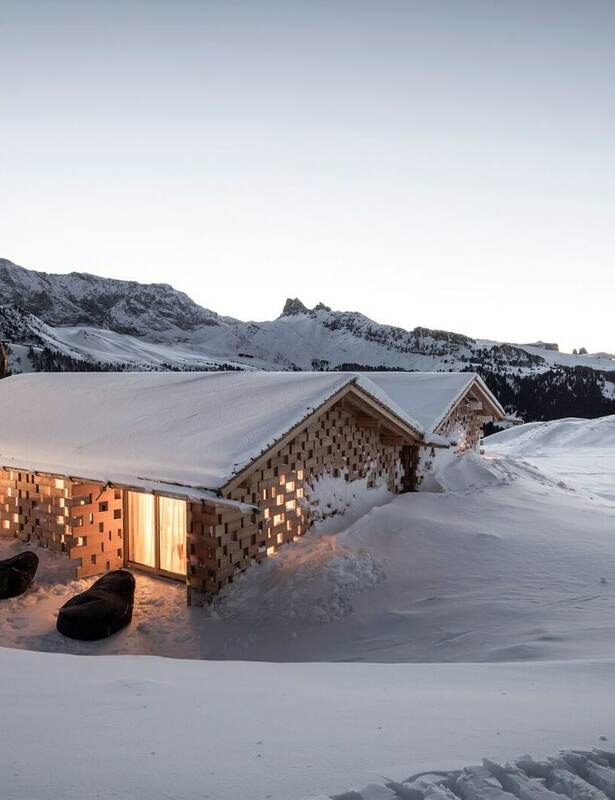 Sustainability, respect for the mountain environment and direct contact with nature are the guiding principles behind all the design choices: the complex, heated by pellet stoves, has obtained ClimaHotel certification. 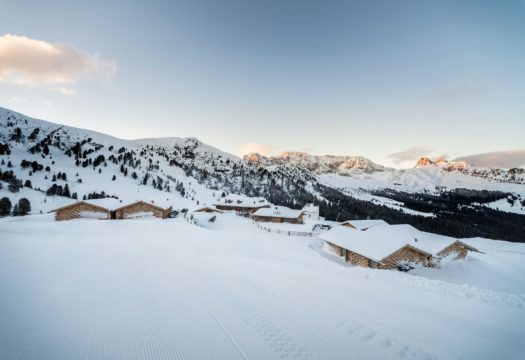 All the materials are also certified; the paths connecting the chalets and the refuge have not been provided with lighting, to prevent light pollution, and a new mobility plan has been launched for maximum environmental protection. 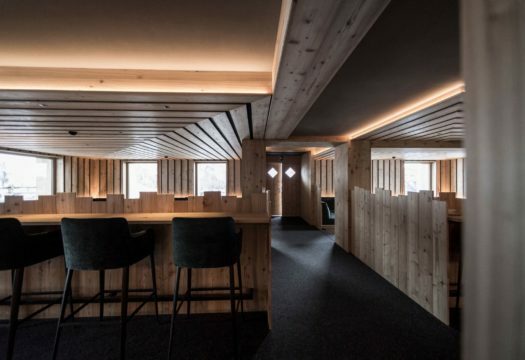 The Zallinger hotel project was recently assigned a prize in the Ahead Awards 2018 in London, and it has been nominated for the prize of the World Architecture Festival – WAF soon to be held in Amsterdam.